January 5, 2018--I recently purchased a tablet holder from Amy's Golden Strand for my K's Creations floor stand and love it!!! I'm able to adjust the height, angle, etc. of where I want the tablet. It's great for watching movies while stitching. Below is a picture of what I see in front of me. Right now I'm using the tablet holder to view the stitching instructions for my current project. All I did was scan the instructions, save it to a directory in "the cloud" (I have OneDrive), then open that saved file on my iPad. No more pieces of paper flying all over the place (usually landing up under the chair, etc.). With 2 fingers, I'm able to enlarge the graphs for more detail, enlarge the project photos, etc. Sweet. PS. You can see a small bit of the television I'm watching on the upper right of my "stitching post". 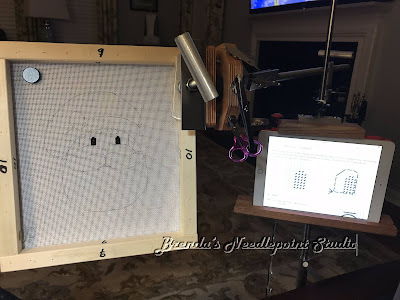 So, when seated, I look ahead at my stitching, down to the right at my instructions, up to the right at the television (my wine glass is on a table to the left--LOL). I do wear bifocal glasses along with "mag eyes" for magnification, so have to move my head a bit to clearly view things, but I'm so used to doing that, I no longer think about it. I had checked directly with the Gay Ann Rogers website 4-5 days ago, but have not received any reply. Now I know why. I did check through your link to "For Groups" section. She seems to be adamant about only selling to groups. I am a solo needlepointer and have no connections with anyone else about doing the needlepoint projects I like to do; in fact I create my own projects usually. I'm looking for a change of pace, and thought the Rogers geometric would be great. All I want to do is buy one copy of the Lady Edith geometric pattern and instructions. Truly a shame that Rogers is so busy that loners lose out. BUMMER! That kind of business-oriented attitude is a real turn-off about ever wanting to use her designs, no matter how striking they might be. I will also give that warning to my local needlepoint supply store here in San Diego. Do you know of any other websites that might feature geometric patterns, or any published books with patterns that emphasize geometric patterns? Hi Dave, Sorry Lady Edith is no longer available. You may have some success looking for the instruction manual on eBay or asking FB members on Needlepoint Nation. Regarding sources for geometrics--I've done many online offerings from the American Needlepoint Guild. You have to be a member, but it's a very inexpensive way to gain access to a wide variety of classes taught by nationally known instructors. Hope you try that route. Hope I've answered your questions. Good luck. Yes, it is a nice tablet holder to fix on floor. We should choose the right type of floor stand for tablets. Factors to consider are height, adjustable enclosure, safety, charging of the device and aesthetics. A lightweight tube and solid ABS enclosure is the perfect match for a floor stand.